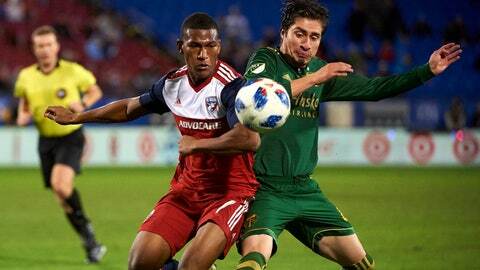 PORTLAND, Ore. (AP) — Portland Timbers defender Jorge Villafana was just a kid in high school when he got a shot at reality show stardom. Villafana’s uncle signed him up for the first Sueno MLS, or Dream MLS, essentially a made-for-TV tryout to play in the league. In 2007, the prize was a shot at Chivas USA’s under-19 team. It is Villafana’s second stint with the Timbers. He was also on the team that won the 2015 MLS Cup. Villafana’s career path is something of a league legend. Not only did his Sueno MLS turn earn him a spot on a team, but since then he’s also played in Liga MX and has become a regular on the U.S. national team. He was on the U.S. roster for the team’s two recent exhibition matches against England and Italy. Villafana was a high school senior when he tried out for Sueno MLS. Known then as Jorge Flores, he seized the opportunity as the youngest player on the under-19 Chivas team and caught the eye of the club’s top level coach, Predrag Radosavljevic. Villafana went on to appear in 86 matches with now-defunct Chivas before he was traded to the Timbers in 2013. He made 50 starts with Portland and played an important role in the team’s 2-1 victory over the Columbus Crew in the MLS Cup. In May, Villafana and his wife were robbed after exchanging currency at a mall in the city of Torreon, Mexico, where Villafana was for the Liga MX final. His team went on to win the league’s Clausura championship.